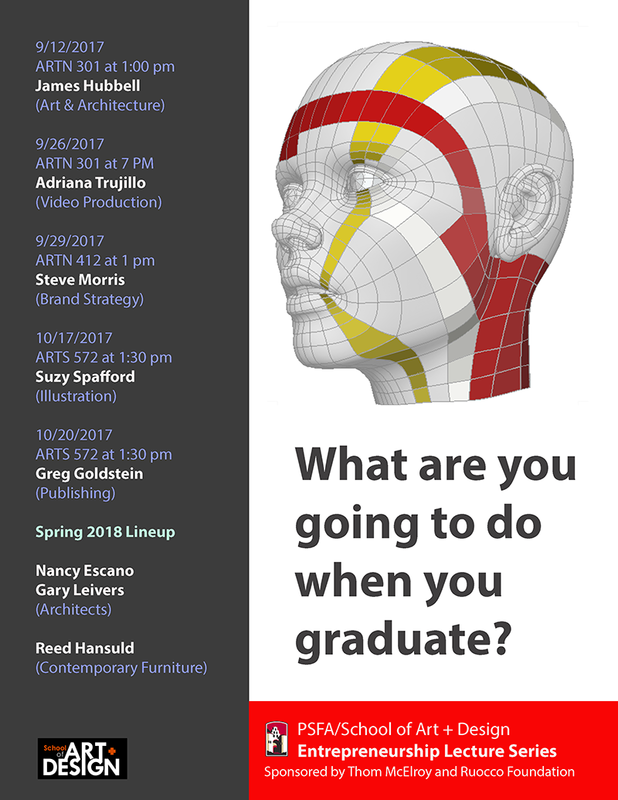 In response to a nationwide survey of alumni that illustrated a need for entrepreneurial training and education for success in the workplace, the School of Art + Design, is offering a series of lectures from industry entrepreneurs. The second annual Entrepreneurship Lecture Series (ELS) aims to fill the skill gap identified in the 2015 Strategic National Alumni Arts Project (SNAAP) survey. The data reveal over 40% of Art + Design alumni considered entrepreneurial skills as crucial to performing effectively in their profession. Now in its second year, ELS was conceived and has been generously funded by School of Art + Design alumnus and successful designer and entrepreneur, Thom McElroy. ELS is a yearlong event that brings well known industry leaders — who also happen to be artists and designers — to campus to share their personal and professional stories of success, and to provide guidance, advice and inspiration to undergrad and graduate students. ELS seeks to help students make the leap from talented artists and designers to financially and professionally successful entrepreneurs.